The piece is constructed in sonata form with all of its sections connected through metric modulations. The exposition presents two main contrasting thematic areas. The first is characterized by its angular rhythmic character, its frequent changes of meter, and constantly shifting timbres and registers. The second area has a more lyrical character. Its main theme is played by the french horn, the trumpet, and the piano over a chromatic background in the strings. The development is divided into two parts based on the main thematic areas. The first part develops the main theme with rapid figurations in the piano while a six-voice canon unfolds in the woodwinds and strings. 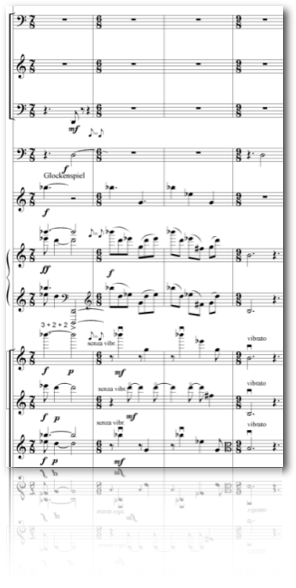 The second part introduces a brass chorale based on the second theme, chromatically ornamented by the woodwind and strings. The recapitulation presents variations on the two themes in inverse order. A final coda, exploiting material from the development of the main theme, concludes the piece.